Applied art takes up more of our lives than we are conscious of. From architecture to fashion, it is a driving source in most economical or historically political situations. Sri Lanka has more historical art in architecture than you ever knew, and we’ve decided to explore five of them. These historic buildings are the records of the past, especially in terms of art and aesthetics, and sociopolitical changes. The vibrant city of Colombo is ever-changing and we think it’s important to appreciate them for their unparalleled architecture. ‘Pettah’, a name derived from the Tamil word, ‘Pettai’, which is an Anglo-Indian word that describes a suburb outside a fort. The Sinhalese translation, ‘pita-kotuwa’ also means ‘outside the fort’. 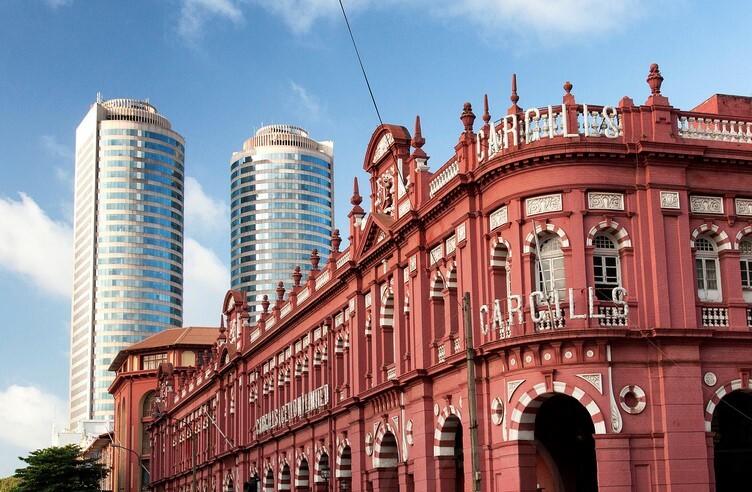 Believe it or not, Pettah is one of the long-standing architectural structures in Sri Lanka. While the streets of Pettah are best known for its markets, some of the oldest built constructions stand in the midst; the ‘Khan Clock Tower’, four stories tall at the entrance of Pettah, was built in 1923 by brothers Bhikhajee and Munchershaw Framjee Khan in memory of their father, Framjee Bhikhajee Khan as its says so in the inscription below the clock, “This clock tower and fountain was erected to the memory of Framjee Bhikhajee Khan by his sons Bhikhajee and Munchershaw Framjee Khan as a token of affectionate gratitude and dedicated through the Municipal Council to the citizens of Colombo on the fourth day of January 1923, the 45th anniversary of his death.” The clock tower still remains on a roundabout and although its water fountain has ceased function, the clock still ticks; the Jami Ul-Alfar Mosque, another long-standing trademark in Pettah. Best known for its red and white striped pattern, the construction of the mosque first began in 1908 and finished in 1909. The architecture inspired by elements from native Indo-Islamic and Indian architecture, and combines it with the Gothic revival and Neo-classical styles, and also contains a clock tower! Why don’t you head on down to Pettah and see for yourself? You might discover a hidden treasure. Says the renowned architect who built the New Sri Lankan Parliament building, located in Sri Jayawardenapura Kotte. It is evident that unlike other architects who rejected colonial architectures in the wake of post-independence, Bawa took on a far more adaptive approach, sourcing design features that were simply appropriate to Sri Lankan lifestyles, not necessarily choosing one style over another. While it is an example of Modernism, it still stands true to the Sri Lankan vernacular architecture. The parliament complex has the allusion of symmetry, made to contrast with the organic form of the ‘Diyanwanna lake’ in which it is located. Construction of the building was initiated on the 4 of July, 1979 and ended on the 29 of April, 1982. The beautiful structure took 26 months to build and cost $25.4million. Between 1640 and 1796, a Dutch Governorate partly governed Sri Lanka. The Dutch took reign over Sri Lanka, then known as Ceylon, in the northern and southern areas. During this time, they captured many pieces of land causing plenty of buildings to go up. In 1681, The Dutch East India Company inaugurated the Old Colombo Dutch Hospital. Contrary to its name, the Dutch Hospital is now a shopping and eating complex with stores, coffee shops and restaurants. The building mirrors Seventeenth century Dutch colonial architecture with thick walls and enormous teak beams and an upper storey built with a wooden floor. The Rio Cinema, in Slave Island was initially a cinema and hotel built in 1979, ‘Colombo’s first city hotel’ hosting ground floor swimming pool and rooftop nightclub. Seven stories high, the space now stands a derelict building due to its burning down in July, 1983 dubbed ‘Black July’ when there was conflict between cultures. Despite its morose past, the structure is still known and used for art exhibitions and festivals such as the Art Biennale and Colomboscope. Unevenly constructed staircases, dark and dingy rooms plus deserted hallways, may sound uninviting but truly provide well for artistic environments. You might think it’s not quite ideal, but paired with its history, the cinema really is one of a kind. Have a look yourself, tell us what you think! The Galle Face Green, while not exactly a structure or building, is still Sri Lanka’s most historical piece of art. Lush, green landscapes contribute to the view and it helps that there’s a spectacular first-hand view of the ocean. The originally planned Galle face extended over a much larger area than what can be seen today. The site, initially laid out in 1859 by Governor Sir Henry George Ward for a military purpose, were used as a means to enable their cannons a strategic line of fire against the Portuguese. 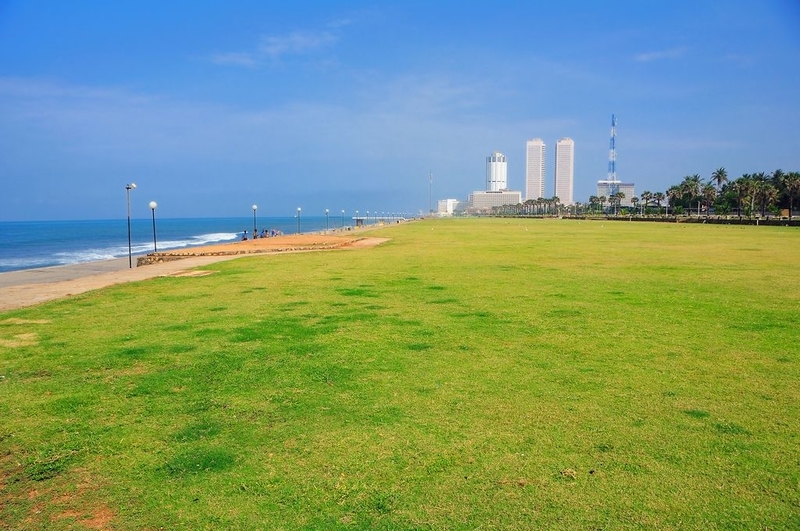 Situated at the heart of the business capital of the country, Colombo, the Galle Face Green is an ocean-side urban park, which stretches for a half kilometre along the coast. If you sit and stroll along at sunset, savour an isso wade and gaze, you will notice each day the space changes little by little. What’s more, Colomboscope, ‘Taste Karaththe’ by Firi Rahman took place there too! Colombo is a busy, bustling city, Sri Lanka’s very own ‘city that never sleeps’. Go on ahead and explore, wander along and discover the city, as old buildings conceal their history.